Now this makes a lot of sense. Groupon this morning announced its latest product, dubbed Groupon Scheduler, an online appointment service that makes it easier for both end users and merchants to go from offer to actual booking. Groupon Scheduler is based on technology from OpenCal, a Vancouver, Canada-based startup Groupon apparently – quietly – acquired in September 2011. The new product will become available to Groupon merchants and consumers in Sacramento and Miami beginning on December 7, 2011 (i.e. today) and be rolled out in other markets “soon after”. 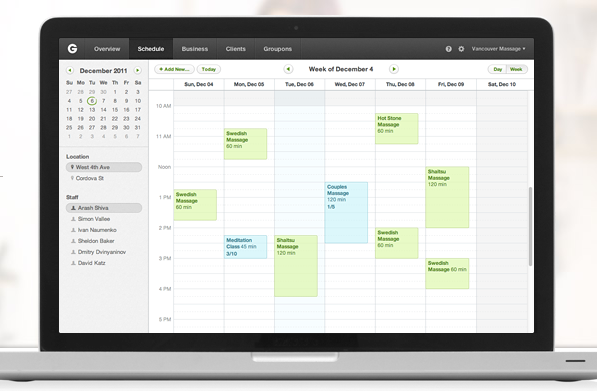 Business owners using Groupon Scheduler can set up an appointment calendar covering all their staff, services and business locations, allowing consumers to instantly book appointments online without having to call or email. The service can be used to take appointments for Groupon features or as a freestanding tool to manage a merchant’s entire calendar. Once they’ve purchased a Groupon deal, consumers can schedule or cancel appointments through their Groupon.com accounts. Both consumers and merchants get immediate email confirmation of each booking, as well as automated email reminders 24 hours before scheduled appointments. Merchants also have the ability to add “Book Now” buttons on their own websites and use Groupon Scheduler to manage online bookings for all their services – not only those offered through Groupon. In other words, this marks Groupon’s entry into the online booking services market. The company is trying hard to become much more than just a pure-play, daily deals site that’s too ‘easy’ to clone.